The films “Wyatt Earp” and “Tombstone” both had scripts by Oscar nominated writers. Wyatt Earp’s Lawrence Kasdan was nominated for “The Accidental Tourist,” “The Big Chill,” and “Grand Canyon.” Tombstone’s Kevin Jarre won for “Glory.” But only “Tombstone” brought us a whole new dialogue for the men of the OK Corral. Although there is enough conversation to carry the story, the script is filled with great one-liners that have become classics over the twenty years since the film was released. And Doc Holliday had some of the best lines. Doc’s catchiest catchphrase is “I’m your Huckleberry,” read by Val Kilmer with a nicely Old South drawl (whether New Orleans or Georgia hardly matters when it works so well!). But what exactly does he mean? And did the real Doc Holliday ever say those words? Read below for the historical origin of the phrase — and then the literary origin. “Tombstone” lovers will find a scene from the 1927 novel “Tombstone: An Iliad of the Southwest” interesting — you’ll recognize it as the model for Doc’s standoff with Johnny Ringo when he quotes that memorable Huckleberry phrase. Did author Walter Noble Burns find some old-timer who remembered Doc saying those words? Or did he just use a clever phrase of the time to give character to his novel? Until we find any record of Doc actually saying “I’m your Huckleberry” it’s anybody’s guess. But if he didn’t say it, he should have! Huckleberries hold a place in archaic American English slang. The tiny size of the berries led to their use as a way of referring to something small, often affectionately as in the lyrics of Moon River. The phrase “a huckleberry over my persimmon” was used to mean “a bit beyond my abilities”. 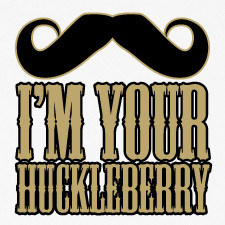 “I’m your huckleberry” is a way of saying that one is just the right person for a given job. The range of slang meanings of huckleberry in the 19th century was fairly large, also referring to significant persons or nice persons. From World Wide Words: Quite how I’m your huckleberry came out of all that with the sense of the man for the job isn’t obvious. It seems that the word came to be given as a mark of affection or comradeship to one’s partner or sidekick. There is often an identification of oneself as a willing helper or assistant about it, as here in True to Himself, by Edward Stratemeyer, dated 1900: “ ‘I will pay you for whatever you do for me.’ ‘Then I’m your huckleberry. Who are you and what do you want to know?’ ”. Despite the obvious associations, it doesn’t seem to derive directly from Mark Twain’s books. (From Walter Noble Burns 1927 novel, “Tombstone: An Iliad of the Southwest”) Wyatt, Virgil, and Morgan Earp and Doc Holliday stood one day in front of Bob Hatch’s saloon and billiard parlour chatting with Mayor Charles N. Thomas. Directly across Allen Street John Ringo, Ike, Finn, and Billy Clanton, and Tom and Frank McLowery lounged in front of the Grand Hotel. The situation appealed to Ringo as ideal for putting into effect his obsession for settling the enmity between Earps and outlaws by personal combat between individual champions. He stalked across the street. Wyatt Earp looked at Ringo for a moment in amazement. He turned on his heel and went inside the saloon. Doc Holliday, second only to Wyatt Earp in the affairs of the Earp faction, remained standing in the door, a cold little smile on his cadaverous face. Ringo drew a handkerchief from the breast pocket of his coat and flipped a corner of it toward Holliday. Holliday took a quick step toward him. Holliday put out a hand and grasped the handkerchief. Both men reached for their six-shooters. That ended it. Holliday went into the saloon. Ringo withdrew across the street.